Fargo 81750 low coercivity (LoCo) magnetic stripe cards are an excellent solution for short term applications such as hotel room keys or visitor cards. Low coercivity cards can easily be erased by contact with a weak magnetic field. 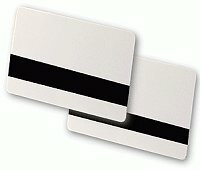 Magnetic stripe cards are designed to be used in card printers with magnetic stripe encoders. Low coercivity can generally be identified by the brown color of their magnetic stripe. Cards that are high coercivity generally have black magnetic stripes. The Fargo 81750 Low Coercivity magnetic stripe cards are CR80 size. CR80 cards are the same size as credit cards, which is the most common size of card. They measure 3.375' x 2.128' and are 30 mil thick. Cards with low coercivity in the CR80 size are also commonly called CR80.030 LoCo cards. Note: Standard PVC cards are best suited to non-laminating direct-to-card printers. If your printer includes a laminator or is a retransfer printer we recommend composite PVC-PET cards.